When Do You Call The Doctor? To call or not to call … When to call the Doctor. 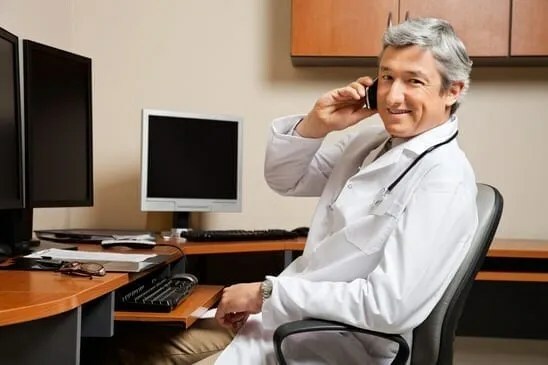 Calling the Doctor–Helpful or Harmful? Our parents or grandparents might answer, “When I feel crummy for two days in a row.” However, we know that a quick fix can lead to unnecessary antibiotic prescriptions, steroids, and pain killers that don’t touch the source of the original problem. We can’t always blame doctors for this. Americans are known for the need to stop pain instantly. Emergency rooms are filled with trauma victims, plus those suffering chronic conditions as well. The Emergency Room specializes in battlefield medicine. “Battlefield medicine” was designed to serve trauma situations – accidents and wars. After World War II, ER replaced herbal and homeopathic medicine as the only type of healing available to the mainstream population. Thankfully, things have changed, a lot. “Alternative medicine” is now so mainstream that many of my clients and friends don’t even have a “regular” doctor. Luckily, they don’t need one. They may have undergone such horrendous experiences with a medical doctor and avoid them like the plague–they won’t call the doctor. I used to be that person. After a childhood of pharmaceutical drugs that destroyed my immune and nervous system, I was terrified of western medicine. Gladly embracing the teachings of Dr. Ann Wigmore, who believed that we could heal our bodies ourselves, I changed my diet and my belief systems, and healed myself. At sometime in our lives, most of us will encounter an issue that does not immediately get better, despite our best efforts. This is when we need to call a doctor, or an alternative practitioner with an extensive medical background. We need to go beyond the team we already know … which, by the way, is how I found my current team! In It Takes Guts To Be Happy! I write that we cannot afford black and white thinking with our health. We can’t let our belief systems, our fears or our loyalty get in the way of our healing process. My client, Loretta, reminded me of that this week. A beautiful, willowy artist, forty-four years old, Loretta had been struggling with Lyme disease and thyroid issues for years. She experienced multiple run-ins with medical doctors who treated her as if she were crazy, (Lyme patients know what I’m talking about), she sought out alternative support. She placed her health in the hands of a local, well-respected practitioner. Walking in to my office for the first time, Loretta sat down and began to cry. Her blood pressure had tanked, she told me. She wasn’t sleeping, yet she could barely get up off the couch. Every day was worse. She was shaky and scared. She had a right to be scared. Her symptoms were serious. I asked her if she would be open to seeing someone new–a doctor who specialized in hormones–and she agreed it was time to call the doctor. Loretta called me today to say that the doctor immediately diagnosed her as having an allergic reaction to her thyroid medication. Loretta was thrilled! She now knew the reason for her crash. With a new medication, her health was on the upswing. When do you call the doctor? When that little voice in your head says, “Something’s really wrong.” Don’t accept anyone’s explanation of your symptoms that doesn’t feel right. Trust your gut. Listen to your friends when they say, “I’m worried about you.” And, if you need the number of a truly integrative physician, check out the ACAM.com website for a practitioner in your area.